I am just in from working with Water Harvest International‘s front team for boring wells. They have a great ministry and drill wells all over this region. We pulled a survey line 300 meters (984 feet) from our north fence to our south fence and would you believe the best pool of water on that line was right at the corner of of the Guesthouse….I am continually amazed at God’s favor! The water is at 42 meters (138 feet) and looks to be be good on the computer ….yeah no more bottled water and no more hiring ladies to haul water for us in jerry cans on their heads. 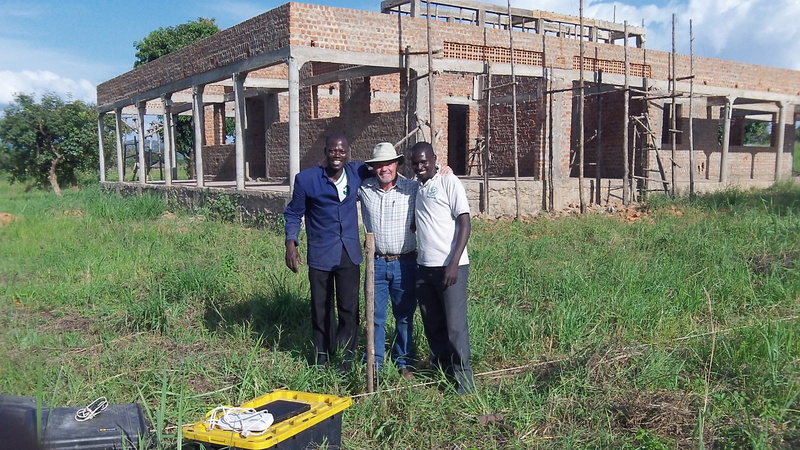 We are standing at the sight of our new bore hole. I am with the two great brothers from World Harvest International who located this prime spot! More pictures are at R.A.U. Guesthouse Building Pictures page. Hello bro Jacob greetings 2u. Hope Moyo is ok Am thankful for the work God is doing & makes things happen. Glory to him. Thank you brother….the Lord is truly blessing! Please keep praying. Blessings on your work in Luwero and Kampala!